UNITED STATES: The American Wind Wildlife Institute (AWWI) has launched a new fund to support new ways to mitigate the impact the industry has on the natural environment. The Wind Wildlife Research Fund already has 28 companies and institutions agreeing to provide investment, and hopes this will increase to 35 members in 2019. It will be used to support research projects to help grow the understanding of the interaction between wind turbines and the local wildlife and habitats. "The fund is a tremendous step forward, and further evidence of the wind industry’s commitment to responsible wind development," signatory EDF Renewables North American CEO Tristan Grimbert said. 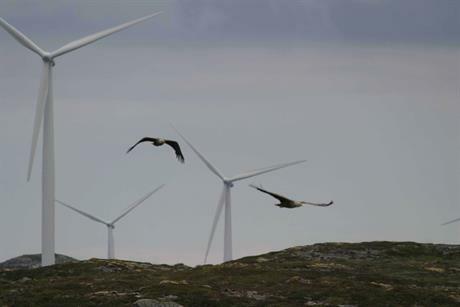 "A significant amount of important research about how to make wind energy safer for wildlife has been done since AWWI was founded in 2008, but collectively, we recognise that there is more to know, and we are pleased to support this initiative," he added. Leeward CEO Greg Wolf added: "This first-of-its-kind fund will make it possible to continue to expand wind energy development while also protecting and conserving wildlife populations. "It speaks volumes about the wind industry’s values that so many companies have stepped up to invest in the fund."